Big spindle bore heavy duty lathes machine manufacturer, Large Spindle Bore Precision Lathe machine - SAN SHING Machinery Ind. Co., Ltd.
SAN SHING Machinery Ind. Co., Ltd.
San Shing Machinery Industrial Co., LTD., originally called San Shing Iron Factory, was founded in 1959, mainly processing various machine parts and stamping bicycle parts. In 1971, with the capital increase and plant expansion, the company moved to present site and renamed San Shing Machinery Industrial Co., LTD. From 1979 onwards, for the training of Taiwan’s machinery industry talents and advance in technical ability to develop, we have participated in cooperative education with many domestic leading academic institutions, providing employment opportunities for socially disadvantaged students. 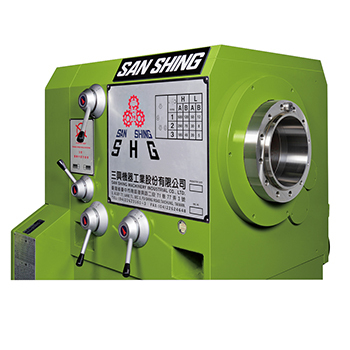 San Shing Machinery Industrial Co., LTD. has been established for more than fifty years, selling worldwide. In addition to a wealth of experience in designing and manufacturing lathe, we are equipped with innovative business ideas. Whether it is research and development, design, or manufacture, we uphold the belief to develop the most superior lathe, remaining customer demand-oriented and sticking to sustainable development. SAN SHING Machinery Ind. Co., Ltd. is a customer-oriented company, for this reason, we assist our customers by facilitating them with products and services integration to exploit Big Spindle Bore Heavy Duty Precision Lathe market and achieve a competitive advantage in their businesses. ● The main spindle is forging as whole-body and sustained by precision bearings. The speeds of spindle have 12 steps and designed on theoretical base. ● All gears and shafts are made of Ni-Cr-Mo steel and carbonize and ground. ● Control of main drive through electromagnetic brake, and automatic forced lubrication. ● Compared with double spindle nose, more suitable for longer tube and pole through-hole turning. Dear Sir/Madam, I’m interested in Big Spindle Bore Heavy Duty Precision Lathe that your company provides. Would you kindly contact me with your detailed product information and FOB price? Thanks. SAN SHING Machinery Ind. Co., Ltd. has been committed to providing Big Spindle Bore Heavy Duty Precision Lathe products for the last 57 years, and was one of the first movers into the lathe industry. SAN SHING Machinery Ind. Co., Ltd. encourages customers to contact us about feedback, comments and questions. We promise that we will reply to you as soon as possible. Add: No.3, Alley 77, Lane 71, Sec2, Fu-Shing Road, Taichung 40245, Taiwan.